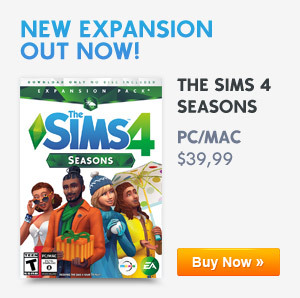 The Baking Skill comes with The Sims 4 Get to Work expansion pack. You can start practicing this skill by baking something in the oven. If your Sim loves cupcakes I suggest that you buy the Cupcake factory for even more recipes! Increasing your baking skill will unlock new Baked Goods for your Oven and Cupcake Factory. 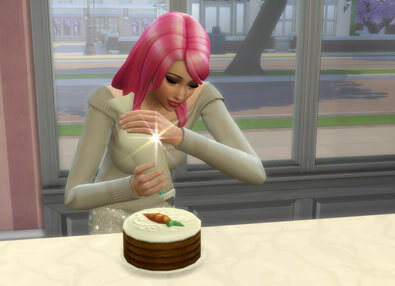 As your Sim progresses in the Baking Skill, they can also add toppings, frosting, or piping (at a small Simoleon cost). This will improve their quality. Baking can be used in the retail system if your Sim wants to run a bakery business. Some essential objects that help sell baked goods include the Cupcake Factory and Warming Rack, which are used to store baked food items. By reaching level 10 with the Baking Skill you will earn the Achievement: Piece of Cake! You can buy 3 volumes of Baking skill books at a Bookcase or at the Computer. Click on the Stove, click Bake, and select a recipe from the list. Click on the Cupcake Factory, select Bake Pastries, and select a recipe from the list. You can take a Thoughtful Shower to get a +1 Inspired moodlet or you can Browse Art on the computer. This will help to level up your Baking Skill faster and bake better quality dishes. The Postcards collection gives off an Inspired aura or you can buy one of the Plumbob lamps: Shine On Ambitions Award or Enchanted Aurora Supernatural Award. It’s recommended to level up a few levels in the Culinary Career to get some of the rewards that give off an Inspired emotional aura in your kitchen. A lot of baked goods can be decorated for 10 Simoleons. This will improve their quality slightly and will also increase their value. For each recipe there are 2 different decorations, this will be randomly chosen when you are decorating your baked goods. Put them in the fridge or warming rack so they won’t spoil within 24 hours. To start your own Bakery you need to buy a retail lot to start your business. Place a Stove and/or Cupcake Factory and make sure you have a Warming Rack to place your bakes goods in the store. You can find Warming Racks under retail items: Frigidare Refrigerated Display and the Baker’s Cousin Display Case. Read the Running a Bakery guide for more detailed information. Use the search bar to filter recipes or ingredients. There is also a cheat to max your Sims Baking Skill. Use the Cheat Console by pressing CTRL+SHIFT+C. Input the cheat code below to max out your skill level. If you don’t want to max your skill level you can change the number 10 with the preferred skill level from 1 to 9. Because there isn’t an option to open up a restaurant with features of serving tables unfortunately. So… the screenshot you have in this article is fake? And other screenshots I saw online too? People keep building bakeries with tables, what for? Thanks for an aswer. This screenshot was taken from the Retail store trailer. It’s not fake but they created a scenery from it. The Sims introduced 3 different baking skills. I think it’s just a matter of time before we can run a restaurant. Help!!! Where to find warming rack? In buy mode, search for “warming rack” ….. Duh! Does anyone know what or where the warming rack is? I have the display case full with food but no one ever eats? love the cheat offered. Only issue is (on my game) it will not work with the cooking skill, fitness skill or mixology skill. But it does work with all the other skills.. Just wanted to give you all a heads up 🙂 thank you for posting the cheat it did help a lot with the rest of the skills!!! Wonderful guide!! I am having a bit of trouble finding blueberries. The game has blackberries, but I have not seen blueberries on any official gardening list or in-game. I found blackberries in the hospital workplace. Hope that helped. If you want the foods racks in a residence, use “testingcheatsenabled true”, go into build mode, type in “bb.showhiddenobjects” and in the search box type in “debug”. That will display the retail items. I opened my bakery, one i downloaded from the gallery, complete with tables, my problem is potential customers take the food from the sales rack and eat servings instead of actually buying anything. I thought about removing the tables so they wont sit around eating but wasn’t sure if they would just stand and eat instead. Anyone else had this problem or any idea how to fix it. I’ve made sure everything has for sale on it, i’m not sure if something is possibly glitched, i threw away the bread everyone was helping themselves to, completely re-baked and set for sale everything in the case and they are helping themselves to brownies now. I’m not sure what is going on. I have a bakery downstairs and an art gallery upstairs. I’m selling mostly art while everyone is eating the items for sale downstairs instead of buying it. I’ve made sure everything is set to sell. Plz help! I built a bakery and put the kitchen for a basement. But the actual selling part of the bakery is on the first floor, and I can’t drag the plate all the way to the first floor to put up for sale! How do I bring the baked goods up plz? you can place them in the inventory of your Sim. My Sim won’t decorate any of her baked goods. She has the skill level but every time I hit decorate, she does the NO thoughts and waves her hands around. It won’t allow me to Decorate y Baked Goods? Why? What is the Procedure?